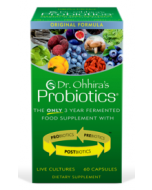 Paradigm-changing probiotic produces a key immune system antioxidant. 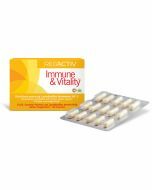 Reg´Activ IMMUNE & VITALITY* contains the revolutionary probiotic strain Lactobacillus fermentum ME-3. Studied for over 20 years, ME-3 produces glutathione—well known for its antioxidant, detoxification, and immune system-supporting activities. The IMMUNE & VITALITY* blend pairs ME-3 with Lactobacillus brevis KP08. That’s a novel Japanese probiotic strain, which supports normal IFN-ɑ production. Together, ME-3 and KP08 provide highly synergistic immune system effects—supporting both the health of immune system cells and their balanced activity. 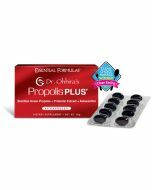 Take 2 capsules daily, 30 minutes before a meal or as directed by a healthcare professional. For optimal effects, maintain a balanced diet and healthy lifestyle. Consult your primary health care provider before using this product. Reg´Activ formulas utilize breakthrough probiotic research to create proven products that support your well-being.